Peacefully, on Sunday, January 13, 2019, Lola Tkachuk passed away at the age of 93. Lola was preceded in death by her husband Roy and son Dennis. She will be lovingly remembered by her sons: Ron (Sherri) and Gerald; grandchildren; great grandchildren; nieces and nephews. The family would like to extend their thanks to Lola’s extended family of Larry and Barb Dimmery for their care and kindness through the years. Lola was born on May 17, 1925 on the family farm in the Gilbert Plains District. After the untimely death of her father, Lola and her twelve brothers and sisters worked the family farm. In 1944, she married Roy Tkachuk. They remained working the farm until relocating to the Poplar Bluff District in 1949. In 1962 they sold the farm and built their home in Portage la Prairie. Lola retired after 25 years of service at MDC. Lola enjoyed many things through her life. Whether it was the fine detailing of crocheting or knitting, or adding the extra place setting at the dinner table for unexpected guest dropping in to sample one of her classic Ukrainian dishes. She got no greater thrill then the time spent out fishing and the joy of being able to boost of her success. Lola enjoyed to travel and loved the experience of seeing new things. She was an avid sports fan, whether it was football or curling on TV or watching one of her “kids” play baseball. 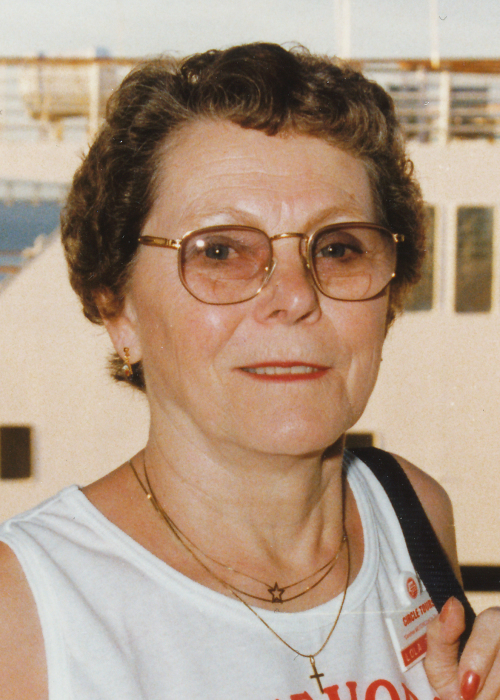 She was an active member in the Prosvita Womens Club for countless years. She always looked forward to the time spent with her friends at Kozy Korner. Funeral service will be held at McKenzies Portage Funeral Chapel on Friday, January 18, 2019 at 11:00 am, led by Wilma Shirriff. Interment will follow at Evergreen Memorial Gardens. As expressions of sympathy, if friends so wish, donations may be made in Lola’s memory to the Lions Prairie Manor Foundation 24-9TH ST. SE. Portage la Prairie, MB , R1N 3V4. Lions Prairie Manor Foundation Inc.